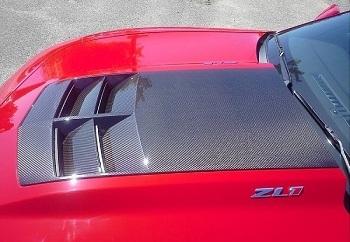 A single-piece air extractor (hood scoop) used on General Motors’ 2012MY Chevrolet Camaro ZL1 employs a carbon fiber-reinforced epoxy prepreg. The air extractor was formed on a tool fabricated from a low-temperature molding composite tooling material. Cytec Industries Inc. (Woodland Park, NJ) supplied both the MTM57 material used for molding and the LTM12 tooling material. MTM57 was reportedly chosen for its exceptional resin clarity and ability to produce an aesthetically-pleasing, rigid structure directly from the mold, with minimal reworking requirements. The part was molded by deBotech Inc. (Mooresville, NC). Cytec will feature the part as well as a range of advanced composite and process material at SAMPE’s Spring Conference in Long Beach, California May 6-9, 2013. The booth will have information about Cytec’s state-of-the-art prepreg and resin systems, including Cycom, LTM, VTM, MTM and HTM in- and out-of-autoclave products, and Prism resin infusion systems, as well as Surfacemaster advanced surfacing films and the BR water-based primer. Cytec will also showcase a wide range of premier vacuum bagging consumables for aerospace and industrial markets.Cytec will also showcase its newest corrosion-inhibiting, modified-epoxy bonding primer, BR 252. The product is specifically formulated to address emerging environmental, health and safety standards. BR 252 provides excellent adhesion and corrosion protection and mechanical properties equal to solvent-based primer systems. It is compatible with most 121-177°C curing adhesives and has a wide curing window and long out time.